The SAM-III Kit is a sophisticated semi-professional magnetometer system designed by Dirk Langenbach and Karsten Hansky. The SAM-III allows real-time sensing of Earth's magnetic (geomagnetic) field. The primary application of the SAM-III is in the sensing and study of geomagnetism. The correspondences between geomagnetic storms, solar events and solar wind, aurora and radio propagation anomalies are well-known. The SAM-III will be a useful instrument to radio astronomers, radio amateurs, aurora photographers and experimenters. Click here for specifications and description of the SAM-III and to download the construction manual and software setup guide. The SAM-III is available in kit form but we offer a PCB-build option (see build option below). We do not recommend this as a first-time kit but if you have technical inclination, can solder or learn to solder, and know how to use a PC, you will have fun building the kit. The SAM-III software is not plug-and-play but installation is as simple as copying a few files to a new folder and determining the serial COM port to be used. Installation requires no more than a few minutes. The software makes no changes to the Windows registry and has been tested with Windows XP, 7, 8 and 10. SAM-III Kits are prepared in limited production runs using private time and effort. We do not procure parts in large quantities, and we setup production runs to satisfy only current demand. Please take that into consideration when you place your order. If you would like to order the SAM-III Kit in quantity, please contact us for a delivery schedule before ordering. The SAM-III Kit includes over 100 components. The original SAM Kit (1- or 2-axis) has been retired and is no longer available. Additional magnetometer sensor with cable connector. AC adapter power supply, 115 Vac, 60 Hz input, regulated 12 Vdc output (with input plug for North America). 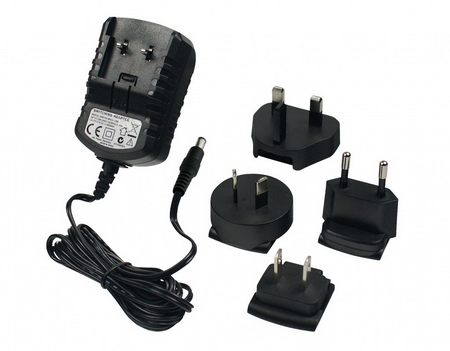 AC adapter power supply with four "worldwide" voltage range and interchangeable input clips. Click here for an image of the clips. Enclosure kit with mounting hardware for display, controller PCB, keyboard PCB and serial connector. The enclosure is made of plastic and includes a cutout and window for the display. The buyer needs to cut holes for the keyboard push-buttons and connectors and make a label. USB-serial adapter (we use various brand including Plugable, Startech and Trendnet). Note: Limited stock. Build Option: With the build option we install all components on both the main and keyboard PCBs and test them together with a live sensor setup in our lab. Note: The build option does not include mounting the PCBs in the optional enclosure. The build option does not include mounting the sensors in a fixture or enclosure. The build option is for buyers who wish to obtain printed circuit board assemblies that are pre-built and tested. For education purposes, we recommend purchasers build their own SAM-III if they have soldering experience. The SAM-III is not a first-time kit. Sensor cable (we recommend a separate cable for each magnetic sensor, direct-buried shielded twisted pair cable or direct-buried coaxial cable for outdoor installations and shielded Cat5 or better cable for indoor installations). Sensor fixture or enclosure (we recommend the builder fabricate an enclosure as described in the construction manual and suitable for their application). See above for link to the page with the manuals. * Our supply of the Speake & Co Llanfapley sensors is exhausted and they will be replaced with the FG sensors from a different manufacturer. ** We may substitute power supplies with slightly different power ratings and part numbers based on stock on hand.